Martin Hairer has been awarded the Fields Medal, the most prestigious prize in maths, at this year's International Congress of Mathematicians in Seoul. 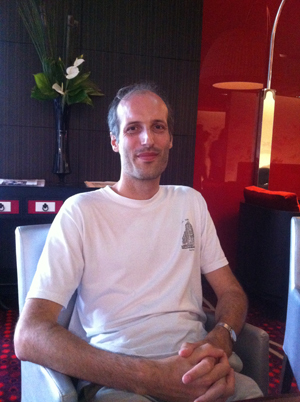 Listen to our interview with Martin Hairer recorded yesterday before the ICM 2014. Martin Hairer is being honoured for a major breakthrough that gives a way of attacking problems that had previously been impenetrable. Many problems in life involve change. That's true in maths just as it is in every day life. For a simple example, think of a tree. It's a growing, living thing that may out-live you by decades or perhaps even centuries. You won't be around to see how tall the tree will be in 100 years' time, but you can still make a prediction. If the tree grows roughly a metre in ten years, then in 100 years' time it should be around 10m taller than now. Easy. Growth is a rate of change: it's the change in size over time. There are many other real-life problems in which you know the rate of change of something with respect to time (or perhaps with respect to some other variables) and you would like to predict the something. The tools of calculus were developed, mostly by Isaac Newton and Gottfried Leibniz in the 17th century, to do just that. It involves equations (called differential equations) which describe how something is changing. The solution to the equation then tells you the value of what you're interested in at any time t in the future (or its dependence on other variables aside from time). This may sound to be too good to be true, and it is. One problem is that many differential equations are incredibly difficult to solve, so your crystal ball remains beyond reach. Hairer's breakthrough concerns a particular class of differential equations whose solutions had previously eluded people. The equations Hairer worked on were special because they involve another thing that causes lots of problems in life: chance. Imagine, for example, you want to predict how stock prices cange over time. You might come up with an equation which describes how the change in stock prices depends on other factors, say supply and demand, but ultimately you can't get away from the fact that the price fluctuations contain a random element. You need to include that randomness in your equation, by including a term that acts a bit like a mathematical cast of a die. Differential equations that allow for randomess are called stochastic differential equations. To name the type of equations Hairer was working on in their full glory, they are called stochastic nonlinear partial differential equations. An example of such an equation, which played an important role in Hairer's work, is the KPZ equation, named after Mehran Kardar, Giorgio Parisi, and Yi-Cheng Zhang, the physicists who first came up with it in 1986. The KPZ equation describes the evolution over time of the boundary at which two substances meet. "For example if you take a sheet of paper and you burn it at one end and observe how the edge of the burning part progresses – the interface between the paper and the ash," says Hairer. At the beginning, before it starts burning, the edge of the page is straight and flat. But as the paper burns this edge gradually becomes irregular and bumpy, and these fluctuations will continue to grow. A solution to the KPZ equations in this example would model how the edge of the paper changes shape over time. Although we are interested in the overall shape, this is influenced by random occurrences at the smallest scales, such as different fragments of the paper burning faster or slower due to irregularities in the paper or slight differences in the air flow around the paper's edge causing the flame to move faster. The problem the KPZ equation posed was that it assumed the solution (the interface of paper and ash) to be nice and smooth (in mathematical terms that it's differentiable) when in reality we know that it isn't. So mathematically the equation did not make sense. Hairer overcame this problem by changing the assumption that the random fluctuations only happen at infinitessimally small scales. Instead he assumed that they happen at scales that are small compared to the scale you are looking at the system. That procedure is called regularising the noise. Once the noise has been "smoothed out" in this way you get an equation that does have a mathematically meaningful solution. It's not a solution to the original KPZ equation, but using the technique it's possible to construct a whole series of objects that converge to the solution of the KPZ equation. There are lots of different ways in which you might regularise the noise, but crucially, Hairer showed that no matter how you do it, you get the same final answer to the KPZ equation. Et voilà! In subsequent work he used the ideas he developed for the KPZ equation to build a general theory, called the theory of regularity structures, which can be applied to a broad class of stochastic partial differential equations. Hairer has a deep intuition about physical systems and this has played a part in his work. "I have always been interested in the physics of sounds, what they look like and what they are made of," he says. There is a connection between the analysis of sound and Hairer's work: wavelet analysis is one of the tools used to understand both. Hairer is fluent in this connection, having developed a successful audio editing software as a teenager. But although Hairer started out as more of a physicist, mathematics was his final destination: "I was always attracted by the fact that in maths statements are permanent." To find out more about differential equations, see these Plus articles.